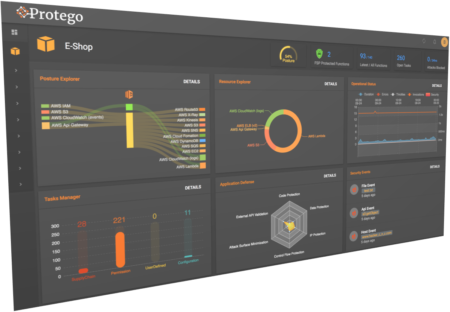 Serverless security provider Protego is offering a new version of its platform to help enterprises adopt serverless. The free starter plan will feature full functionality, protection for up to one million invocations and 30 days of data retention. In addition, Protego offers four other tiers of its solution: Base, Standard, Pro and Enterprise. These tiers feature one year of data retention and an increase allotment of functions and invocations. All versions will focus on three components: proact, observe and defend. Proact is meant to minimize the surface attack for serverless solutions. Protego is designed to continuously scan serverless infrastructure. This area features a policy manager to analyze function roles and permissions, a posture explorer for a security-focused view, and a code supply chain tracker for managing third-party libraries. Observe refers to the ability to detect attacks and provide visibility. Here, Protego can scan serverless infrastructure, code and runtime environments, and use deep learning algorithms to detect threats, anomalies and malicious attacks. In addition, this area features “actionable intelligence” and tools to provide full visibility and root cause analysis. Lastly, defend refers to providing elastic serverless security. The solution will be able to identify and prevent attacks in real time with the minimum effective dose of protection capability. Protego also offers function self-protection to inspect and filter inputs as well as block attacks.